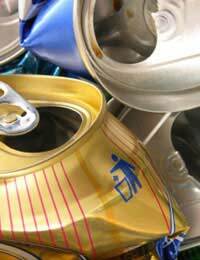 In 2005/6 an estimated 5 billion aluminium cans were used in the UK alone. Most of the soft drinks we consume come in easy to use/easy to dispose of cans, and increasingly so does a lot of the food available nowadays. Also we are using a lot more aluminium products that are easy to use once and then throw away: in the kitchen, as foil, and as milk bottle tops, for instance. Also, as the UK is becoming takeaway food addicts, notice that most of the containers for takeaways are aluminium too. Perhaps because it is such a light metal, easily crushed, that we take it so much for granted. But it is a metal, and one of the most useful because of its manipulativeness. But there is some good news about aluminium: it is recyclable, and we have the technology and facilities to do so. The most important issue here is educating ourselves primarily to cut down on waste where we can, and to concentrate on using materials, such as aluminium, that can be reused or recycled , and to put less and less rubbish in the landfill. As responsible individuals, part of the bigger more environmentally-aware community, we should now all be aiming at zero waste output from our houses, and probably our businesses too, within 2 to 5 years. As the aluminium companies have developed the technologies to recycle the material, they have understood the economic value of this recycled product, as well as the environmental value. It is now regarded as the most valuable recycled product, and so the companies involved actively offer incentives to collect cans and other aluminium products from the public. Schools, as places where lots of canned drinks are consumed, are involved in collecting the cans and are rewarded by involvement in schemes where the metal companies pour back some of their profit into overseas environmental work, such as tree-planting in Africa. Check to see if any schools near you are or have been involved in any projects like this: it can give greater meaning and purpose to recycling when you see something specific and worthwhile coming of your efforts. If this isn't possible, check with your local Council. It is probable that their weekly roadside collection scheme will accept aluminium cans and washed aluminium foil, such as kitchen roll foil and takeaway containers. Casting the product into ingots, which are approximately 27 tonnes in weight, and contain in the region of 1.6 million used cans. The ingots are then delivered back to the can makers, and the new cans made from the recycled metal can be back on the supermarket shelves within 6-8 weeks. The reprocessing companies are also working with the automobile industry to supply them with recycled aluminium or use in car parts. From can to car – its worthwhile recycling the can in your hand!